There is no such thing as a “general public.” That’s one of the messages graduating senior Lauren Reczek, a public communications major, shared with representatives from some of Western New York’s nonprofits at a free workshop on March 26. Instead, Reczek encouraged attendees to focus on their stakeholders—the clients, donors, volunteers, and others who are interested in the organization’s mission. Reczek began using social media while attending high school at the Buffalo Academy of the Sacred Heart. There, she started a student-run Twitter account. At Buffalo State, she has taken advantage of service-learning opportunities to work with organizations such as Upstate New York Transplant Services, the Restoration Society, Hamburg BurgerFest, and the National Center for Missing and Exploited Children's Buffalo Office. “I am driven to help others and the causes that I resonate most with,” she said. “Giving back to my community is rewarding because I get to connect with people from different backgrounds and cultures. Listening to their stories inspires me to do more for others.” Reczek is planning to submit an article about her experience with this workshop to a service-learning journal. Jericho Road Community Health Center, Family Promise of WNY, Open Buffalo, Old Fort Niagara, the St. Vincent de Paul Society of Buffalo, and the Kadimah Academy were among the organizations who attended the workshop. 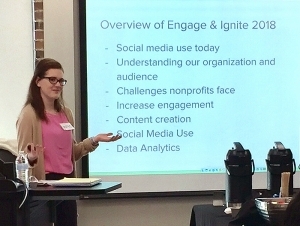 Reczek discussed social media strategy, analytics, and ideas for content. She recommended that organizations identify the audience they want to reach—typically stakeholders in the organization. She also encouraged participants to have a plan for social media, and to schedule time to develop content for their posts.